"Russian Federation" redirects here. For other uses of "Russia", see Russia (disambiguation). Russia ( i/ˈrʌʃə/; Russian: Росси́я, tr. Rossija; IPA: [rɐˈsʲijə] ( listen)), also officially known as the Russian Federation (Russian: Росси́йская Федера́ция, tr. Rossijskaja Federacija; IPA: [rɐˈsʲijskəjə fʲɪdʲɪˈratsɨjə] ( listen)), is a sovereign state in northern Eurasia. It is a federal semi-presidential republic. 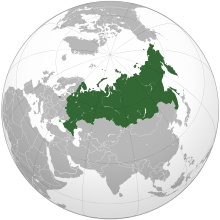 At 17,125,200 square kilometres (6,612,100 sq mi), Russia is the largest country in the world, covering more than one-eighth of the Earth's inhabited land area. Russia is the world's ninth most populous country with over 146.6 million people at the end of March 2016. Extending across the entirety of northern Asia and much of Eastern Europe, Russia spans eleven time zones and incorporates a wide range of environments and landforms. From northwest to southeast, Russia shares land borders with Norway, Finland, Estonia, Latvia, Lithuania and Poland (both with Kaliningrad Oblast), Belarus, Ukraine, Georgia, Azerbaijan, Kazakhstan, China, Mongolia, and North Korea. It shares maritime borders with Japan by the Sea of Okhotsk and the U.S. state of Alaska across the Bering Strait. The nation's history began with that of the East Slavs, who emerged as a recognizable group in Europe between the 3rd and 8th centuries AD. Founded and ruled by a Varangian warrior elite and their descendants, the medieval state of Rus arose in the 9th century. 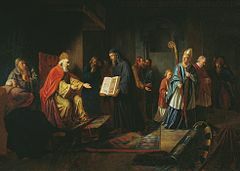 In 988 it adopted Orthodox Christianity from the Byzantine Empire, beginning the synthesis of Byzantine and Slavic cultures that defined Russian culture for the next millennium. Rus' ultimately disintegrated into a number of smaller states; most of the Rus' lands were overrun by the Mongol invasion and became tributaries of the nomadic Golden Horde in the 13th century. The Grand Duchy of Moscow gradually reunified the surrounding Russian principalities, achieved independence from the Golden Horde, and came to dominate the cultural and political legacy of Kievan Rus'. 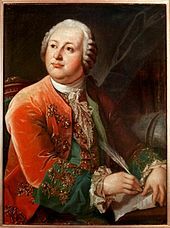 By the 18th century, the nation had greatly expanded through conquest, annexation, and exploration to become the Russian Empire, which was the third largest empire in history, stretching from Poland in Europe to Alaska in North America. 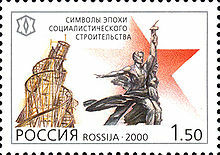 Following the Russian Revolution, the Russian Soviet Federative Socialist Republic became the largest and leading constituent of the Soviet Union abbreviated to USSR, the world's first constitutionally socialist state and a recognized world superpower, and a rival to the United States which played a decisive role in the Allied victory in World War II. The Soviet era saw some of the most significant technological achievements of the 20th century, including the world's first human-made satellite, and the first man in space. By the end of 1990, the Soviet Union had the world's second largest economy, largest standing military in the world and the largest stockpile of weapons of mass destruction (the state detonated in 1961 the Tsar Bomba, which was mankind's most powerful nuclear bomb ever built). 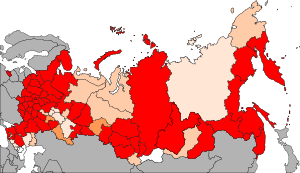 Following the partition of the Soviet Union in 1991, fourteen independent republics emerged from the USSR; as the largest, most populous, and most economically developed republic, the Russian SFSR reconstituted itself as the Russian Federation and is recognized as the continuing legal personality (the sole successor state) of the Soviet Union. The Russian economy ranks as the twelfth largest by nominal GDP and sixth largest by purchasing power parity in 2015. Russia's extensive mineral and energy resources, the largest reserves in the world, have made it one of the largest producers of oil and natural gas globally. The country is one of the five recognized nuclear weapons states and possesses the largest stockpile of weapons of mass destruction. Russia was the world's second biggest exporter of major arms in 2010-14, according to SIPRI data. Russia is a great power and a permanent member of the United Nations Security Council, a member of the G20, the Council of Europe, the Asia-Pacific Economic Cooperation (APEC), the Shanghai Cooperation Organisation (SCO), the Organization for Security and Co-operation in Europe (OSCE), and the World Trade Organization (WTO), as well as being the leading member of the Commonwealth of Independent States (CIS), the Collective Security Treaty Organization (CSTO) and one of the 5 members of the Eurasian Economic Union (EEU), along with Armenia, Belarus, Kazakhstan, and Kyrgyzstan. The name Russia is derived from Rus, a medieval state populated mostly by the East Slavs. However, this proper name became more prominent in the later history, and the country typically was called by its inhabitants "Русская Земля" (russkaja zemlja), which can be translated as "Russian Land" or "Land of Rus'". In order to distinguish this state from other states derived from it, it is denoted as Kievan Rus' by modern historiography. The name Rus itself comes from Rus people, a group of Varangians (possibly Swedish Vikings) who founded the state of Rus (Русь). An old Latin version of the name Rus' was Ruthenia, mostly applied to the western and southern regions of Rus' that were adjacent to Catholic Europe. The current name of the country, Россия (Rossija), comes from the Byzantine Greek designation of the Kievan Rus', Ρωσσία Rossía—spelt Ρωσία (Rosía pronounced [roˈsia]) in Modern Greek. In classical antiquity, the Pontic Steppe was known as Scythia. Beginning in the 8th century BC, Ancient Greek traders brought their civilization to the trade emporiums in Tanais and Phanagoria. The Romans settled on the western part of the Caspian Sea, where their empire stretched towards the east. [dubious – discuss] In the 3rd to 4th centuries AD a semi-legendary Gothic kingdom of Oium existed in Southern Russia until it was overrun by Huns. Between the 3rd and 6th centuries AD, the Bosporan Kingdom, a Hellenistic polity which succeeded the Greek colonies, was also overwhelmed by nomadic invasions led by warlike tribes, such as the Huns and Eurasian Avars. A Turkic people, the Khazars, ruled the lower Volga basin steppes between the Caspian and Black Seas until the 10th century. Ivan III ("the Great") finally threw off the control of the Golden Horde and consolidated the whole of Central and Northern Rus' under Moscow's dominion, He was also the first to take the title "Grand Duke of all the Russias". After the fall of Constantinople in 1453, Moscow claimed succession to the legacy of the Eastern Roman Empire. Ivan III married Sophia Palaiologina, the niece of the last Byzantine emperor Constantine XI, and made the Byzantine double-headed eagle his own, and eventually Russia's, coat-of-arms. The death of Ivan's sons marked the end of the ancient Rurik Dynasty in 1598, and in combination with the famine of 1601–03 led to civil war, the rule of pretenders, and foreign intervention during the Time of Troubles in the early 17th century. The Polish-Lithuanian Commonwealth occupied parts of Russia, including Moscow. In 1612, the Poles were forced to retreat by the Russian volunteer corps, led by two national heroes, merchant Kuzma Minin and Prince Dmitry Pozharsky. 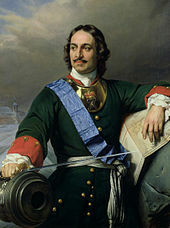 The Romanov Dynasty acceded to the throne in 1613 by the decision of Zemsky Sobor, and the country started its gradual recovery from the crisis. The reign of Peter I's daughter Elizabeth in 1741–62 saw Russia's participation in the Seven Years' War (1756–63). During this conflict Russia annexed East Prussia for a while and even took Berlin. However, upon Elisabeth's death, all these conquests were returned to the Kingdom of Prussia by pro-Prussian Peter III of Russia. Tsar Nicholas II of Russia. 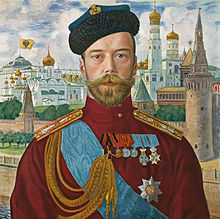 The February Revolution forced Nicholas II to abdicate; he and his family were imprisoned and later executed in Yekaterinburg during the Russian Civil War. The monarchy was replaced by a shaky coalition of political parties that declared itself the Provisional Government. An alternative socialist establishment existed alongside, the Petrograd Soviet, wielding power through the democratically elected councils of workers and peasants, called Soviets. The rule of the new authorities only aggravated the crisis in the country, instead of resolving it. 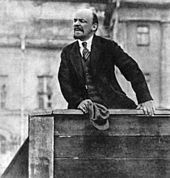 Eventually, the October Revolution, led by Bolshevik leader Vladimir Lenin, overthrew the Provisional Government and gave full governing power to the Soviets, leading to the creation of the world's first socialist state. Under Stalin's leadership, the government launched a planned economy, industrialisation of the largely rural country, and collectivization of its agriculture. During this period of rapid economic and social change, millions of people were sent to penal labor camps, including many political convicts for their opposition to Stalin's rule; millions were deported and exiled to remote areas of the Soviet Union. The transitional disorganisation of the country's agriculture, combined with the harsh state policies and a drought, led to the Soviet famine of 1932–1933. The Soviet Union, though with a heavy price, was transformed from a largely agrarian economy to a major industrial powerhouse in a short span of time. The Appeasement policy of Great Britain and France towards Adolf Hitler's annexation of Austria and Czechoslovakia did not stem an increase in the power of Nazi Germany and initiated a threat of war to the Soviet Union. Around the same time, the Third Reich allied with the Empire of Japan, a rival of the USSR in the Far East and an open enemy of the USSR in the Soviet–Japanese Border Wars in 1938–39. In August 1939, after another failure of attempts to establish an anti-Nazi alliance with Britain and France, the Soviet government decided to improve relations with Germany by concluding the Molotov-Ribbentrop Pact, pledging non-aggression between the two countries and dividing Eastern Europe into their respective spheres of influence. While Hitler conquered Poland and France and other countries acted on a single front at the start of World War II, the USSR was able to build up its military and claim some of the former territories of the Russian Empire, Western Ukraine, Hertza region and Northern Bukovina as a result of the Soviet invasion of Poland, Winter War, occupation of the Baltic states and Soviet occupation of Bessarabia and Northern Bukovina. On 22 June 1941, Nazi Germany broke the non-aggression treaty and invaded the Soviet Union with the largest and most powerful invasion force in human history, opening the largest theater of World War II. Although the German army had considerable early success, their attack was halted in the Battle of Moscow. Subsequently, the Germans were dealt major defeats first at the Battle of Stalingrad in the winter of 1942–43, and then in the Battle of Kursk in the summer of 1943. Another German failure was the Siege of Leningrad, in which the city was fully blockaded on land between 1941 and 1944 by German and Finnish forces, and suffered starvation and more than a million deaths, but never surrendered. Under Stalin's administration and the leadership of such commanders as Georgy Zhukov and Konstantin Rokossovsky, Soviet forces took Eastern Europe in 1944–45 and captured Berlin in May 1945. In August 1945 the Soviet Army ousted the Japanese from China's Manchukuo and North Korea, contributing to the allied victory over Japan. The 1941–45 period of World War II is known in Russia as the "Great Patriotic War". The Soviet Union together with the United States, the United Kingdom and China were considered as the Big Four of Allied powers in World War II  and later became the Four Policemen which was the foundation of the United Nations Security Council. During this war, which included many of the most lethal battle operations in human history, Soviet military and civilian deaths were 10.6 million and 15.9 million respectively, accounting for about a third of all World War II casualties. The full demographic loss to the Soviet peoples was even greater. The Soviet economy and infrastructure suffered massive devastation which caused the Soviet famine of 1946–47 but the Soviet Union emerged as an acknowledged military superpower on the continent. After Stalin's death and a short period of collective rule, the new leader Nikita Khrushchev denounced the cult of personality of Stalin and launched the policy of de-Stalinization. The penal labor system was reformed and many prisoners were released and rehabilitated (many of them posthumously). The general easement of repressive policies became known later as the Khrushchev Thaw. At the same time, tensions with the United States heightened when the two rivals clashed over the deployment of the U.S. Jupiter missiles in Turkey and Soviet missiles in Cuba. Following the ousting of Khrushchev in 1964, another period of collective rule ensued, until Leonid Brezhnev became the leader. The era of the 1970s and the early 1980s was designated later as the Era of Stagnation, a period when economic growth slowed and social policies became static. The 1965 Kosygin reform aimed for partial decentralization of the Soviet economy and shifted the emphasis from heavy industry and weapons to light industry and consumer goods but was stifled by the conservative Communist leadership. In 1979, after a Communist-led revolution in Afghanistan, Soviet forces entered that country at the request of the new regime. The occupation drained economic resources and dragged on without achieving meaningful political results. Ultimately, the Soviet Army was withdrawn from Afghanistan in 1989 due to international opposition, persistent anti-Soviet guerilla warfare, and a lack of support by Soviet citizens. On 31 December 1999, President Yeltsin unexpectedly resigned, handing the post to the recently appointed Prime Minister, Vladimir Putin, who then won the 2000 presidential election. 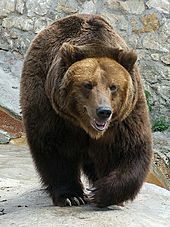 Putin suppressed the Chechen insurgency although sporadic violence still occurs throughout the Northern Caucasus. High oil prices and the initially weak currency followed by increasing domestic demand, consumption, and investments has helped the economy grow for nine straight years, improving the standard of living and increasing Russia's influence on the world stage. While many reforms made during the Putin presidency have been generally criticized by Western nations as undemocratic, Putin's leadership over the return of order, stability, and progress has won him widespread admiration in Russia. In 2014, after President Viktor Yanukovych of Ukraine fled as a result of a revolution, Putin requested and received authorization from the Russian Parliament to deploy Russian troops to Ukraine. Following a Crimean referendum in which separation was favored by a large majority of voters, but not accepted internationally, the Russian leadership announced the accession of Crimea into the Russian Federation. On 27 March the United Nations General Assembly voted in favor of a non-binding resolution opposing the Russian annexation of Crimea by a vote of 100 in favour, 11 against and 58 abstentions. As one of five permanent members of the UN Security Council, Russia plays a major role in maintaining international peace and security. The country participates in the Quartet on the Middle East and the Six-party talks with North Korea. Russia is a member of the G8 industrialized nations, the Council of Europe, OSCE, and APEC. 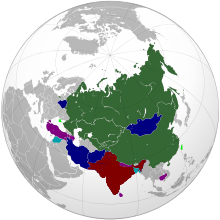 Russia usually takes a leading role in regional organisations such as the CIS, EurAsEC, CSTO, and the SCO. 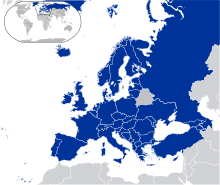 Russia became the 39th member state of the Council of Europe in 1996. In 1998, Russia ratified the European Convention on Human Rights. The legal basis for EU relations with Russia is the Partnership and Cooperation Agreement, which came into force in 1997. The Agreement recalls the parties' shared respect for democracy and human rights, political and economic freedom and commitment to international peace and security. In May 2003, the EU and Russia agreed to reinforce their cooperation on the basis of common values and shared interests. Former President Vladimir Putin had advocated a strategic partnership with close integration in various dimensions including establishment of EU-Russia Common Spaces. 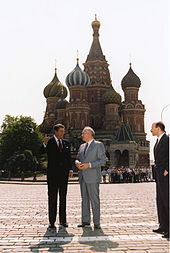 Since the dissolution of the Soviet Union, Russia has developed a friendlier relationship with the United States and NATO. The NATO-Russia Council was established in 2002 to allow the United States, Russia and the 27 allies in NATO to work together as equal partners to pursue opportunities for joint collaboration. An important aspect of Russia's relations with the West is the criticism of Russia's political system and human rights management (including LGBT rights, media freedom, and reports about killed journalists) by Western governments, the mass media and the leading democracy and human rights watchdogs. In particular, such organisations as the Amnesty International and Human Rights Watch consider Russia to have not enough democratic attributes and to allow few political rights and civil liberties to its citizens. Freedom House, an international organisation funded by the United States, ranks Russia as "not free", citing "carefully engineered elections" and "absence" of debate. Russian authorities dismiss these claims and especially criticise Freedom House. The Russian Ministry of Foreign Affairs has called the 2006 Freedom in the World report "prefabricated", stating that the human rights issues have been turned into a political weapon in particular by the United States. The ministry also claims that such organisations as Freedom House and Human Rights Watch use the same scheme of voluntary extrapolation of "isolated facts that of course can be found in any country" into dominant tendencies. The country has a large and fully indigenous arms industry, producing most of its own military equipment with only few types of weapons imported. Russia is one of the world's top supplier of arms, a spot it has held since 2001, accounting for around 30% of worldwide weapons sales and exporting weapons to about 80 countries. The Stockholm International Peace Research Institute, SIPRI, found that Russia was the second biggest exporter of arms in 2010-14, increasing their exports by 37 per cent from the period 2005-2009. In 2010-14, Russia delivered weapons to 56 states and to rebel forces in eastern Ukraine. The Russian government's published 2014 military budget is about 2.49 trillion rubles (approximately US$69.3 billion), the third largest in the world behind the US and China. The official budget is set to rise to 3.03 trillion rubles (approximately US$83.7 billion) in 2015, and 3.36 trillion rubles (approximately US$93.9 billion) in 2016. However, unofficial estimates put the budget significantly higher, for example the Stockholm International Peace Research Institute (SIPRI) 2013 Military Expenditure Database estimated Russia's military expenditure in 2012 at US$90.749 billion. This estimate is an increase of more than US$18 billion on SIPRI's estimate of the Russian military budget for 2011 (US$71.9 billion). As of 2014[update], Russia's military budget is higher than any other European nation. 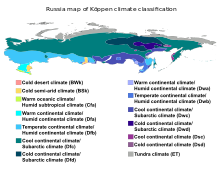 Russia map of Köppen climate classification. 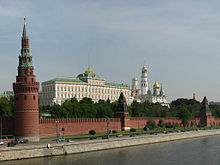 Russia is the largest country in the world; its total area is 17,125,200 square kilometres (6,612,100 sq mi). There are 23 UNESCO World Heritage Sites in Russia, 40 UNESCO biosphere reserves, 41 national parks and 101 nature reserves. It lies between latitudes 41° and 82° N, and longitudes 19° E and 169° W.
The two most widely separated points in Russia are about 8,000 km (4,971 mi) apart along a geodesic line. 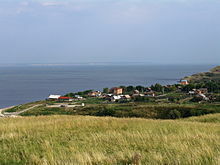 These points are: a 60 km (37 mi) long Vistula Spit the boundary with Poland separating the Gdańsk Bay from the Vistula Lagoon and the most southeastern point of the Kuril Islands. The points which are farthest separated in longitude are 6,600 km (4,101 mi) apart along a geodesic line. These points are: in the west, the same spit on the boundary with Poland, and in the east, the Big Diomede Island. The Russian Federation spans nine time zones. Russia has a developed, high-income market economy with enormous natural resources, particularly oil and natural gas. It has the 15th largest economy in the world by nominal GDP and the 6th largest by purchasing power parity (PPP). Since the turn of the 21st century, higher domestic consumption and greater political stability have bolstered economic growth in Russia. The country ended 2008 with its ninth straight year of growth, but growth has slowed with the decline in the price of oil and gas. Real GDP per capita, PPP (current international) was 19,840 in 2010. Growth was primarily driven by non-traded services and goods for the domestic market, as opposed to oil or mineral extraction and exports. The average nominal salary in Russia was $967 per month in early 2013, up from $80 in 2000. In March 2014 the average nominal monthly wages reached 30,000 RUR (or US$980), while tax on the income of individuals is payable at the rate of 13% on most incomes. Approximately 12.8% of Russians lived below the national poverty line in 2011, significantly down from 40% in 1998 at the worst point of the post-Soviet collapse. Unemployment in Russia was 5.4% in 2014, down from about 12.4% in 1999. The middle class has grown from just 8 million persons in 2000 to 104 million persons in 2013. However, after U.S.-led sanctions since 2014 and a collapse in oil prices, the proportion of middle-class could halve to 20%. Sugar imports reportedly dropped 82% between 2012 and 2013 as a result of the increase in domestic output. The economic development of the country has been uneven geographically with the Moscow region contributing a very large share of the country's GDP. Inequality of household income and wealth has also been noted, with Credit Suisse finding Russian wealth distribution so much more extreme than other countries studied it "deserves to be placed in a separate category." Another problem is modernisation of infrastructure, ageing and inadequate after years of being neglected in the 1990s; the government has said $1 trillion will be invested in development of infrastructure by 2020. In December 2011, Russia finally[clarification needed] joined the World Trade Organisation, allowing it a greater access to overseas markets. Some analysts estimate that WTO membership could bring the Russian economy a bounce of up to 3% annually. Russia ranks as the second-most corrupt country in Europe (after Ukraine), according to the Corruption Perceptions Index. The Norwegian-Russian Chamber of Commerce also states that "[c]orruption is one of the biggest problems both Russian and international companies have to deal with". The high rate of corruption acts as a hidden tax as businesses and individuals often have to pay money that is not part of the official tax rate. It is estimated that corruption is costing the Russian economy an estimated $2 billion (80 billion rubles) per year. In 2014, a book-length study by Professor Karen Dawisha was published concerning corruption in Russian under Putin's government. The Russian central bank announced plans in 2013 to free float the Russian ruble in 2015. According to a stress test conducted by the central bank Russian financial system would be able to handle a currency decline of 25%–30% without major central bank interference. However, Russian economy began stagnating in late 2013 and in combination with the War in Donbass is in danger of entering stagflation, slow growth and high inflation. The Russian ruble collapsed by 24% from October 2013 to October 2014 entering the level where the central bank may need to intervene to strengthen the currency. Moreover, after bringing inflation down to 3.6% in 2012, the lowest rate since gaining independence from the Soviet Union, inflation in Russia jumped to nearly 7.5% in 2014, causing the central bank to increase its lending rate to 8% from 5.5% in 2013. In an October 2014 article in Bloomberg Business Week, it was reported that Russia had significantly started shifting its economy towards China in response to increasing financial tensions following its annexation of Crimea and subsequent Western economic sanctions. Russia is the 3rd largest electricity producer in the world and the 5th largest renewable energy producer, the latter because of the well-developed hydroelectricity production in the country. Large cascades of hydropower plants are built in European Russia along big rivers like the Volga. The Asian part of Russia also features a number of major hydropower stations, however the gigantic hydroelectric potential of Siberia and the Russian Far East largely remains unexploited. Typically, major Russian cities have well-developed systems of public transport, with the most common varieties of exploited vehicles being bus, trolleybus and tram. Seven Russian cities, namely Moscow, Saint Petersburg, Nizhny Novgorod, Novosibirsk, Samara, Yekaterinburg, and Kazan, have underground metros, while Volgograd features a metrotram. The total length of metros in Russia is 465.4 kilometres (289.2 mi). Moscow Metro and Saint Petersburg Metro are the oldest in Russia, opened in 1935 and 1955 respectively. 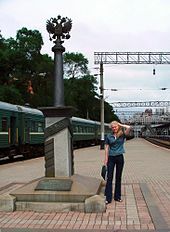 These two are among the fastest and busiest metro systems in the world, and are famous for rich decorations and unique designs of their stations, which is a common tradition in Russian metros and railways. 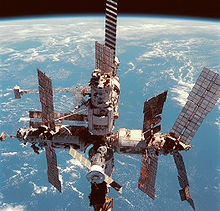 After the collapse of the Soviet Union, some government-funded space exploration programs, including the Buran space shuttle program, were cancelled or delayed, while participation of the Russian space industry in commercial activities and international cooperation intensified. Nowadays Russia is the largest satellite launcher. 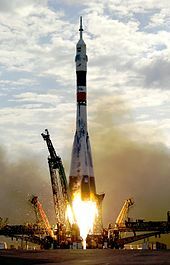 After the U.S. Space Shuttle program ended in 2011, Soyuz rockets became the only provider of transport for astronauts at the International Space Station. 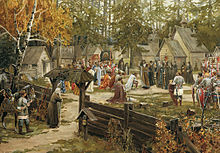 The ancestors of many of today's Russians practised Orthodox Christianity since the 10th century. 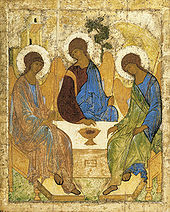 According to the Orthodox Church Tradition, Christianity was first brought to the territory of modern Belarus, Russia and Ukraine by Saint Andrew, the first Apostle of Jesus Christ. 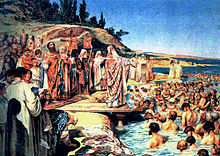 Following the Primary Chronicle, the definitive Christianization of Kievan Rus' dates from the year 988 (the year is disputed), when Vladimir the Great was baptized in Chersonesus and proceeded to baptize his family and people in Kiev. 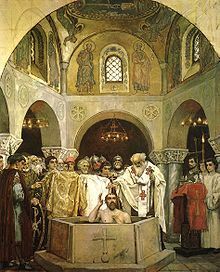 The latter events are traditionally referred to as baptism of Rus' (Russian: Крещение Руси, Ukrainian: Хрещення Русі) in Russian and Ukrainian literature. At the time of the 1917 Revolution, the Russian Orthodox Church was deeply integrated into the autocratic state, enjoying official status. This was a significant factor that contributed to the Bolshevik attitude to religion and the steps they took to control it. 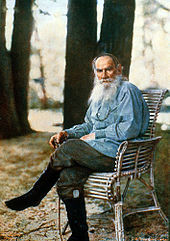 Bolsheviks consisted of many people with non-Russian, Communist Russians and influential Jewish backgrounds such as Vladimir Lenin, Leon Trotsky, Grigory Zinoviev, Lev Kamenev, Grigori Sokolnikov who were indifferent towards Christianity and based on the writings of Jewish philosopher Karl Marx with Marxism–Leninism as an ideology went on to form the Communist party. Thus the USSR became the first state to have, as an ideological objective, the elimination of religion and its replacement with universal atheism. The communist regime confiscated religious property, ridiculed religion, harassed believers, and propagated atheism in schools. The confiscation of religious assets was often based on accusations of illegal accumulation of wealth. 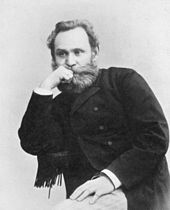 The vast majority of people in the Russian empire were, at the time of the revolution, religious believers, whereas the communists aimed to break the power of all religious institutions and eventually replace religious belief with atheism. "Science" was counterposed to "religious superstition" in the media and in academic writing. The main religions of pre-revolutionary Russia persisted throughout the entire Soviet period, but they were only tolerated within certain limits. Generally, this meant that believers were free to worship in private and in their respective religious buildings (churches, mosques, etc. ), but public displays of religion outside of such designated areas were prohibited. In addition, religious institutions were not allowed to express their views in any type of mass media, and many religious buildings were demolished or used for other purposes. State Atheism in the Soviet Union was known as gosateizm, and was based on the ideology of Marxism–Leninism. Marxist–Leninist Atheism has consistently advocated the control, suppression, and elimination of religion. Within about a year of the revolution, the state expropriated all church property, including the churches themselves, and in the period from 1922 to 1926, 28 Russian Orthodox bishops and more than 1,200 priests were killed. Many more were persecuted. Currently, there is no official census of religion in Russia, and estimates are based on surveys only. In August 2012, ARENA estimated that about 46.8% of Russians are Christians (including Orthodox, Catholic, Protestant, and non-denominational), while 25% believed in God but without any religion. However, later that year, the Levada Center estimated that 76% of Russians are Christians, and in June 2013, the Public Opinion Foundation estimated that 65% of Russians are Christians. These findings are in line with Pew Research Center's 2011 survey, which estimated that 73.6% of Russians are Christians, with Russian Public Opinion Research Center (VCIOM)'s 2010 survey (~77% Christian), and with Ipsos MORI's 2011 survey (69%). 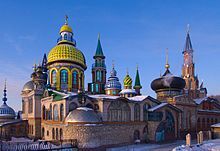 Orthodox Christianity, Islam, Judaism and Buddhism are Russia's traditional religions, and are all legally a part of Russia's "historical heritage". Islam is the second largest religion in Russia after Russian Orthodoxy. It is the traditional or predominant religion amongst some Caucasian ethnicities (notably the Chechens, the Ingush and the Circassians), and amongst some Turkic peoples (notably the Tatars and the Bashkirs). Altogether, there are 9,400,000 Muslims in Russia or 6.5% of the total population as of 2012[update] (the share of Muslims is probably much higher because the survey doesn't include detailed data for the traditionally Islamic states of Chechnya and Ingushetia). Notwithstanding, various differences split the Muslim population in different groups. According to the survey, most of the Muslims (approximately 6,700,000 or 4.6% of the total population) are "unaffiliated" to any Islamic schools and branches or Islamic organisation, this is mainly because it is not essential for Muslims to be affiliated with any specific sect or organization. Those who are affiliated are mostly Sunni Muslims, with Shia and Ahmadiyya minorities. Unaffiliated Muslims constitute significant numbers of over 10% in Kabardino-Balkaria (49%), Bashkortostan (38%), Karachay-Cherkessia (34%), Tatarstan (31%), Yamalia (13%), Orenburg Oblast (11%), Adygea (11%) and Astrakhan Oblast (11%). Most of the regions of Siberia have an unaffiliated Muslim population of 1% to 2%. According to various western purposive reports, the number of non-religious in Russia is between 16% and 48% of the population. The number of atheists has decreased significantly; according to the recent statistic, only seven percent declared themselves atheists, a decrease of 5% in three years. In a 2012 poll by Gallup International, 6% of Russian people reported that they were "convinced atheists which is lowest among European countries"
As of 2014[update], the average life expectancy in Russia was 65.29 years for males and 76.49 years for females. The biggest factor contributing to the relatively low life expectancy for males is a high mortality rate among working-age males. Deaths mostly occur because of preventable causes (e.g., alcohol poisoning, smoking, traffic accidents, violent crime). As a result of the large gender difference in life expectancy, and also because of the lasting effect of high casualties in World War II, the gender imbalance remains to this day; there are 0.859 males to every female. 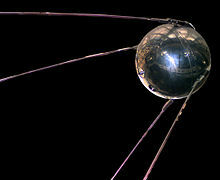 Russia was among the first countries to introduce radio and television. While there were few channels in the Soviet time, in the past two decades many new state and privately owned radio stations and TV channels have appeared. In 2005 a state-run English language Russia Today TV started broadcasting, and its Arabic version Rusiya Al-Yaum was launched in 2007. Combining the total medals of the Soviet Union and Russia, the country is second among all nations by number of gold medals both at the Summer Olympics and at the Winter Olympics. Soviet and later Russian athletes have always been in the top three for the number of gold medals collected at the Summer Olympics. Soviet gymnasts, track-and-field athletes, weight lifters, wrestlers, boxers, fencers, shooters, cross country skiers, biathletes, speed skaters and figure skaters were consistently among the best in the world, along with Soviet basketball, handball, volleyball and ice hockey players. The 1980 Summer Olympics were held in Moscow while the 2014 Winter Olympics were hosted in Sochi. The Kontinental Hockey League (KHL) was founded in 2008 as a successor to the Russian Superleague. It is seen as a rival to the National Hockey League (NHL), is ranked the top hockey league in Europe as of 2009[update], and the second-best in the world. It is an international professional ice hockey league in Eurasia and consists of 28 teams, of which 21 are based in Russia and 7 more are located in Latvia, Kazakhstan, Belarus, Finland, Slovakia, and Croatia. Association football is one of the most popular sports in modern Russia. The Soviet national team became the first ever European Champions by winning Euro 1960. Appearing in four FIFA World Cups from 1958 to 1970, Lev Yashin is regarded to be one of the greatest goalkeepers in the history of football, and was chosen on the FIFA World Cup Dream Team. The Soviet national team reached the final of Euro 1988. In 1956 and 1988, the Soviet Union won gold at the Olympic football tournament. Russian clubs CSKA Moscow and Zenit St Petersburg won the UEFA Cup in 2005 and 2008 respectively. The Russian national football team reached the semi-finals of Euro 2008, losing only to the eventual champions Spain. Russia will host the 2018 FIFA World Cup, with 11 host cities located in the European part of the country and in the Ural region. Larisa Latynina, who currently holds the record for the most gold Olympic medals won by a woman (and held the record for most Olympic medals won per person from 1964 until 2012 when swimmer Michael Phelps replaced her record), established the USSR as the dominant force in gymnastics for many years. Today, Russia is the leading nation in rhythmic gymnastics with Yevgeniya Kanayeva. Russian synchronized swimming is the best in the world, with almost all gold medals at Olympics and World Championships having been swept by Russians in recent decades. Figure skating is another popular sport in Russia, especially pair skating and ice dancing. With the exception of 2010 a Soviet or Russian pair has won gold at every Winter Olympics since 1964. Since the end of the Soviet era, tennis has grown in popularity and Russia has produced a number of famous players, including Maria Sharapova, the world's highest paid female athlete. In martial arts, Russia produced the sport Sambo and renowned fighters, like Fedor Emelianenko. Chess is a widely popular pastime in Russia; from 1927, Russian grandmasters have held the world chess championship almost continuously. The 2014 Winter Olympics were held in Sochi in the south of Russia. Russia won the largest number of medals among the participating nations with 13 gold, 11 silver, and 9 bronze medals for a total of 33 medals. Commentators evaluated the Games as having been an overall success. Formula One is also becoming increasingly popular in Russia. In 2010 Vitaly Petrov of Vyborg became the first Russian to drive in Formula One, and was soon followed by a second - Daniil Kvyat, from Ufa - in 2014. There had only been two Russian Grands Prix (in 1913 and 1914), but the Russian Grand Prix returned as part of the Formula One season in 2014, as part of a six-year deal. Victory Day is the second most popular holiday in Russia; it commemorates the victory over Nazism in the Great Patriotic War. A huge military parade, hosted by the President of Russia, is annually organised in Moscow on Red Square. Similar parades take place in all major Russian cities and cities with the status Hero city or City of Military Glory. Tourism in Russia has seen rapid growth since the late Soviet period, first domestic tourism and then international tourism, fueled by the rich cultural heritage and great natural variety of the country. Major tourist routes in Russia include a journey around the Golden Ring of ancient cities, cruises on the big rivers like the Volga, and long journeys on the famous Trans-Siberian Railway. In 2013, Russia was visited by 28.4 million tourists; it is the ninth most visited country in the world and the seventh most visited in Europe. The number of Western visitors dropped in 2014. The warm subtropical Black Sea coast of Russia is the site for a number of popular sea resorts, like Sochi, the follow-up host of the 2014 Winter Olympics. The mountains of the Northern Caucasus contain popular ski resorts such as Dombay. The most famous natural destination in Russia is Lake Baikal, the Blue Eye of Siberia. This unique lake, the oldest and deepest in the world, has crystal-clear waters and is surrounded by taiga-covered mountains. Other popular natural destinations include Kamchatka with its volcanoes and geysers, Karelia with its lakes and granite rocks, the snowy Altai Mountains, and the wild steppes of Tyva. ^ a b c d "ВПН-2010". perepis-2010.ru. Archived from the original on 18 January 2012. 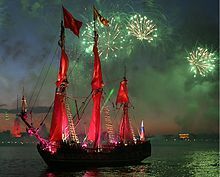 ^ 862 marks the "arrival of Rurik", considered a foundation event by the Russian authorities (Указ Президента РФ "О праздновании 1150-летия зарождения российской государственности" (Russian)); 882 marks the accession of Oleg of Novgorod. ^ a b c d "General Information". Russian 6Embassy. Retrieved 14 February 2016. ^ "Report for Selected Countries and Subjects: Russia". IMF. April 2016. ^ "Income Gini coefficient". Human Development Reports (Source: World Bank 2013). UNDP. Retrieved 26 August 2015. ^ Taylor, Adam (22 March 2014). "Crimea has joined the ranks of the world's 'gray areas.' Here are the others on that list.". The Washington Post. Retrieved 27 March 2014. ^ a b c Excerpted from Glenn E. Curtis (ed.) (1998). 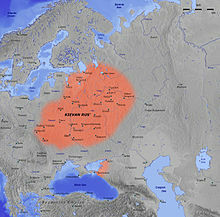 "Russia: A Country Study: Kievan Rus' and Mongol Periods". Washington, D.C.: Federal Research Division of the Library of Congress. Retrieved 20 July 2007. ^ Peter Turchin; Thomas D. Hall; Jonathan M. Adams (2006). "East-West Orientation of Historical Empires" (PDF). Journal of World-Systems Research, Vol. 12 (no. 2). pp. 219–229. Archived from the original (PDF) on 22 February 2007. ^ Jonathan R. Adelman; Cristann Lea Gibson (1 July 1989). Contemporary Soviet Military Affairs: The Legacy of World War II. Unwin Hyman. p. 4. ISBN 978-0-04-445031-3. Retrieved 15 June 2012. ^ GDP – Million 1990. CIA Factbook. 1991. Retrieved 30 November 2015. ^ a b "Country Profile: Russia". Foreign & Commonwealth Office of the United Kingdom. Archived from the original on 16 October 2009. Retrieved 27 December 2007. ^ "Report for Selected Countries and Subjects". IMF. Retrieved 27 April 2015. ^ a b "International Energy Agency – Oil Market Report" (PDF). 18 January 2012. Archived from the original (PDF) on 18 May 2012. Retrieved 20 February 2012. ^ a b "Trends in International Arms Transfer, 2014". www.sipri.org. Stockholm International Peace Research Institute. Retrieved 18 March 2015. ^ Milner-Gulland, R. R. (1997). The Russians: The People of Europe. Blackwell Publishing. pp. 1–4. ISBN 0-631-21849-1. ^ Jacobson, E. (1995). The Art of the Scythians: The Interpenetration of Cultures at the Edge of the Hellenic World. Brill. p. 38. ISBN 90-04-09856-9. ^ Tsetskhladze, G. R. (1998). The Greek Colonisation of the Black Sea Area: Historical Interpretation of Archaeology. F. Steiner. p. 48. ISBN 3-515-07302-7. ^ Turchin, P. (2003). Historical Dynamics: Why States Rise and Fall. Princeton University Press. pp. 185–186. ISBN 0-691-11669-5. ^ Christian, D. (1998). A History of Russia, Central Asia and Mongolia. Blackwell Publishing. pp. 286–288. ISBN 0-631-20814-3. ^ Obolensky, D. (1994). Byzantium and the Slavs. St Vladimir's Seminary Press. p. 42. ISBN 0-88141-008-X. ^ Thompson, J.W. ; Johnson, E.N. (1937). An Introduction to Medieval Europe, 300–1500. W. W. Norton & Co. p. 268. ISBN 0-415-34699-1. ^ Klyuchevsky, V. (1987). The course of the Russian history 1. Myslʹ. ISBN 5-244-00072-1. ^ Solovyov, S. (2001). History of Russia from the Earliest Times 6. AST. pp. 562–604. ISBN 5-17-002142-9. ^ Skrynnikov, R. (1981). Ivan the Terrible. Academic Intl Pr. p. 219. ISBN 0-87569-039-4. ^ Solovyov, S. (2001). History of Russia from the Earliest Times 6. AST. pp. 751–908. ISBN 5-17-002142-9. ^ Eizo Matsuki. "The Crimean Tatars and their Russian-Captive Slaves." (PDF). Mediterranean Studies Group at Hitotsubashi University. Archived from the original (PDF) on 1 May 2011. Retrieved 4 May 2013. ^ Solovyov, S. (2001). History of Russia from the Earliest Times 6. AST. pp. 751–809. ISBN 5-17-002142-9. ^ Brian Glyn Williams (2013). "The Sultan's Raiders: The Military Role of the Crimean Tatars in the Ottoman Empire" (PDF). The Jamestown Foundation. p. 27. ^ Solovyov, S. (2001). History of Russia from the Earliest Times 7. AST. pp. 461–568. ISBN 5-17-002142-9. ^ Solovyov, S. (2001). History of Russia from the Earliest Times. 9, ch.1. AST. ISBN 5-17-002142-9. Retrieved 27 December 2007. ^ Brinkley, Douglas. The New York Times Living History: World War II, 1942-1945: The Allied Counteroffensive. 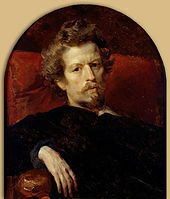 Macmillan, 2004. ^ Urquhart, Brian. Looking for the Sheriff. New York Review of Books, 16 July 1998. ^ "1990 CIA World Factbook". Central Intelligence Agency. Retrieved 9 March 2008. ^ Walter C. Clemens (2001). The Baltic Transformed: Complexity Theory and European Security. Rowman & Littlefield. p. 106. ISBN 0-8476-9859-9. ^ Jason Bush (19 October 2006). "What's Behind Russia's Crime Wave?". BusinessWeek. Archived from the original on 20 December 2008. ^ A. Aslund. "Russia's Capitalist Revolution" (PDF). Retrieved 28 March 2008. ^ Treisman, D. "Is Russia's Experiment with Democracy Over?". UCLA International Institute. Archived from the original on 11 November 2004. Retrieved 31 December 2007. ^ "Ukraine crisis: Crimea parliament asks to join Russia". BBC News. 6 March 2014. Retrieved 27 April 2015. ^ "OSCE". Retrieved 27 April 2015. ^ "Jobbik MEP Béla Kovács: The Crimean referendum is perfectly legitimate". hungarianambiance.com. 16 March 2014. Retrieved 27 April 2015. ^ "Democracy at a standstill" (PDF). World Justice Project. 2013. p. 7. Retrieved 9 August 2014. 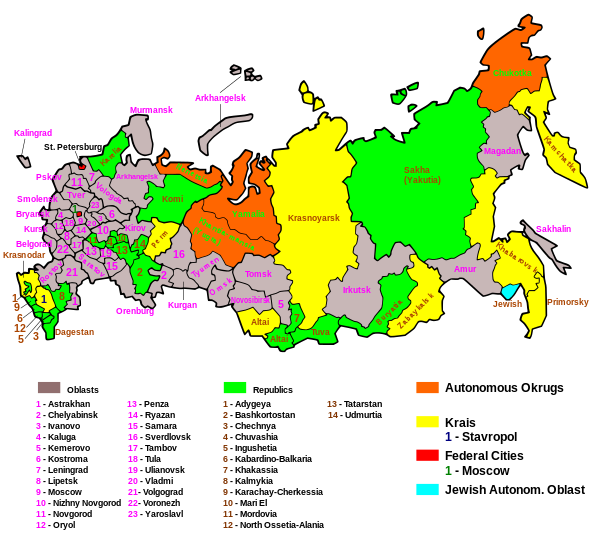 ^ "Russian Federation – Member state". Council of Europe. Retrieved 28 April 2015. ^ "Legal framework - The Partnership and Cooperation Agreement". Delegation of the European Union to Russia. 13 February 2009. Retrieved 27 April 2015. ^ "Political framework - Europe and Russia: Building a Strategic Partnership". Delegation of the European Union to Russia. 13 February 2009. Retrieved 27 April 2015. ^ "Interview of official Ambassador of Russian Foreign Ministry on relations with the EU" (in Russian). RIA Novosti. Retrieved 30 June 2008. ^ "NATO-Russia relations". NATO. Archived from the original on 11 April 2007. Retrieved 27 December 2007. ^ "Amnesty International report on Russia". Amnesty International. Archived from the original on 13 July 2010. Retrieved 11 July 2010. ^ "Overview of the major Asian Powers" (PDF). International Institute for Strategic Studies: 31. Retrieved 27 January 2008. ^ "US drives world military spending to record high". Australian Broadcasting Corporation. Archived from the original on 13 June 2006. Retrieved 27 December 2007. ^ "The Constitution of the Russian Federation". pravo.gov.ru (in Russian). 11 April 2014. pp. 19, 21. ^ "Treaty Between the Russian Federation and the Republic of Crimea on Ascension to the Russian Federation of the Republic of Crimea and on Establishment of New Subjects Within the Russian Federation" (in Russian). Kremlin.ru. 18 March 2014. Retrieved 10 April 2014. ^ Mark Adomanis (9 October 2012). 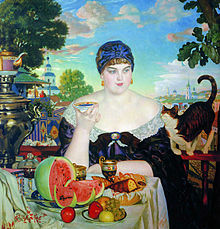 "What is the Russian Middle Class? Probably Not What You Think". Forbes. Retrieved 27 April 2015. ^ "Russia: How Long Can The Fun Last?". BusinessWeek. Archived from the original on 4 January 2007. Retrieved 27 December 2007. ^ "A Rising Middle Class Will Fuel Growth in Russia". nielsen.com. 27 March 2013. Retrieved 27 April 2015. ^ Tavernise, S. (23 March 2002). "Russia Imposes Flat Tax on Income, and Its Coffers Swell". The New York Times. Retrieved 27 December 2007. ^ "Russia: How Long Can The Fun Last?". BusinessWeek. Archived from the original on 13 December 2006. Retrieved 27 December 2007. ^ "Inequality and the Putin Economy: Inside the Numbers". pbs.org. Frontline. Retrieved 14 January 2015. ^ "Doing business in Russia". Norwegian-Russian Chamber of Commerce. 10 June 2012. Archived from the original on 18 September 2007. Retrieved 10 June 2012. ^ Putin's Kleptocracy: Who Owns Russia?, published 30 September 2014, by Karen Dawisha. ^ Ostroukh, Andrey (17 January 2014). "Russia Ready to Float Ruble Next Year Regardless of Rate". Wall Street Journal. ^ Razumovskaya, Olga (25 July 2014). "Russian Central Bank Raises Key Interest Rate to 8% From 7.5%". Wall Street Journal. ^ "China Embraces Russia", Bloomberg Business Week, 9 October 2014, pp 15–16. ^ Глобальная оценка лесных ресурсов 2010 года [Global Forest Resources Assessment 2010] (PDF) (in Russian). FAO Forestry Working Paper 163, Rome, Italy. 2010. ^ "The Russian Federation Forest Sector Outlook Study to 2030" (PDF). FAO. Rome, Italy. 2012. Retrieved 4 May 2013. ^ "BP Statistical Review of World Energy June 2009: Hydroelectricity consumption". Archived from the original on 6 February 2009. Retrieved 29 October 2010. ^ a b "Russian Railways". Eng.rzd.ru. Archived from the original on 4 October 2009. Retrieved 2 January 2010. ^ "Invest in Russia–Infrastructure". Invest.gov.ru. Archived from the original on 26 April 2011. Retrieved 27 April 2010. ^ "Transport in Russia". International Transport Statistics Database. iRAP. Archived from the original on 17 April 2009. Retrieved 17 February 2009. ^ "Russian Atomic Icebreakers". English Russia. 31 March 2008. Retrieved 27 April 2015. ^ "The Poincaré Conjecture". Claymath.org. Archived from the original on 28 April 2013. Retrieved 4 May 2013. ^ "Resident population". Rosstat. Archived from the original on 3 March 2012. Retrieved 27 December 2007. ^ "Russia cracking down on illegal migrants". International Herald Tribune. 15 January 2007. Archived from the original on 15 September 2008. ^ Putin tries to lure millions of Russian expats home at the Wayback Machine (archived 25 May 2010) Times Online. 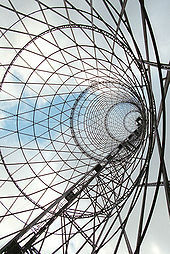 9 February 2006. ^ a b "Demographic balance and crude rates at national level". Eurostat. Retrieved 1 June 2016. ^ "Country Profile: Russia" (PDF). Library of Congress—Federal Research Division. October 2006. Retrieved 27 December 2007. ^ "Russia trying to resolve demographic problem through immigration". rian.ru. 14 July 2006. 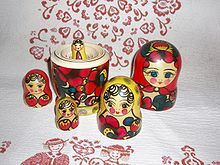 ^ "Immigration Drives Russian Population Increase". ria.ru. 20 August 2012. ^ "Russian Census of 2002". 4.3. Population by nationalities and knowledge of Russian; 4.4. Spreading of knowledge of languages (except Russian). Rosstat. Retrieved 16 January 2008. ^ "JAXA - My Long Mission in Space". ^ a b "Constitution of the Republic of Crimea". Article 10 (in Russian). State Council, Republic of Crimea. 11 April 2014. Retrieved 14 October 2014. ^ Microsoft Encarta Online Encyclopedia 2007. Russia. Retrieved 2007-12-27. ^ a b Kowalewski, David (October 1980). "Protest for Religious Rights in the USSR: Characteristics and Consequences". Russian Review 39 (4): 426–441. doi:10.2307/128810. JSTOR 128810 – via JSTOR. (registration required (help)). ^ Ramet, Sabrina Petra. (Ed) (1993). Religious Policy in the Soviet Union. Cambridge University Press. p. 4. ^ Anderson, John (1994). Religion, State and Politics in the Soviet Union and Successor States. Cambridge, England: Cambridge University Press. p. 3. ISBN 0-521-46784-5. ^ "Anti-religious Campaigns". Loc.gov. Retrieved 2011-09-19. ^ Пресс выпуски - В России 74% православных и 7% мусульман [Press releases - In Russia 74% are Orthodox and 7% are Muslims]. levada.ru (in Russian). 17 December 2012. Retrieved 29 April 2015. ^ Ценности: религиозность [Values: Religious]. fom.ru (in Russian). 14 June 2013. Retrieved 29 April 2015. ^ "Global Christianity – A Report on the Size and Distribution of the World's Christian Population". Pew Research Center's Religion & Public Life Project. 19 December 2011. Retrieved 29 April 2015. ^ ВЦИОМ: Социальное самочувствие россиян и экономические реалии: непересекающиеся пространства? [MEETING OF THE SCIENTIFIC COUNCIL VCIOM: The social well-being of Russians and economic realities: a disjointed space?]. Russian Public Opinion Research Center (in Russian). 28 October 2014. Retrieved 29 April 2015. ^ "Views on globalisation and faith" (PDF). 5 July 2011. p. 40. Archived from the original (PDF) on 17 January 2013. ^ Rev. Canon Michael Bourdeaux (2002). "Trends in Religious Policy". In Imogen Bell. Eastern Europe, Russia and Central Asia 2003 (3 ed.). Taylor & Francis. p. 47. ISBN 978-1-85743-137-7. Retrieved 29 April 2015. ^ Сведения о религиозных организациях, зарегистрированных в Российской Федерации по данным Федеральной регистрационной службы [Data about religious organizations registered in Russian Federation according to Federal Migration Service records] (in Russian). 19 December 2006. Retrieved 27 December 2007. ^ "Over 90 percent of Russians are going to celebrate Easter anyway - poll". Interfax Religion. 22 April 2011. Retrieved 2 November 2011. ^ "Russian Federation". Europe: Belarus, Russian Federation and Ukraine. World and Its Peoples. Marshall Cavendish. 2010. p. 1387. ISBN 978-0-7614-7900-0. Retrieved 29 April 2015. ^ Ingvar Svanberg; David Westerlund (6 December 2012). Islam Outside the Arab World. Routledge. p. 418. ISBN 978-1-136-11330-7. Retrieved 29 April 2015. ^ 2012 Survey Maps. "Ogonek", No. 34 (5243), 27 August 2012. Retrieved 24 September 2012. ^ Richard Hellie. "Russia". Encyclopedia Britannica. Retrieved 29 April 2015. ^ Zuckerman, P. (2005). "Atheism: Contemporary Rates and Patterns". In Michael Martin. The Cambridge Companion to Atheism. Cambridge University Press. 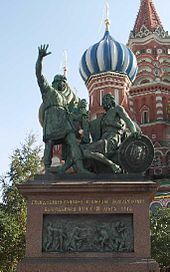 ^ Социологи вновь посчитали верующих россиян [Sociologists have counted Russian believers anew] (in Russian). Sova Center. 15 January 2013. Retrieved 29 April 2013. ^ "Global Index of Religion and Atheism" (PDF). WIN/Gallup International. Retrieved 7 November 2015. ^ Российский омбудсмен будет бороться с дискриминацией по "прописке" через суд [Russian ombudsman will be fighting discrimination based on passport "registration" in the courts] (in Russian). 6 June 2007. Retrieved 23 July 2008. ^ a b ОЖИДАЕМАЯ ПРОДОЛЖИТЕЛЬНОСТЬ ЖИЗНИ ПРИ РОЖДЕНИИ [Life expectancy at birth] (XLS). Rosstat. 2 April 2015. Retrieved 26 April 2015. ^ "Higher Education Institutions". Rosstat. Archived from the original on 3 March 2012. Retrieved 1 January 2008. ^ "Education for All by 2015: will we make it?" (PDF). EFA global monitoring report. 2008. Retrieved 27 April 2010. ^ "Higher education structure". State University Higher School of Economics. Archived from the original on 13 December 2010. Retrieved 27 December 2007. ^ "Over 20,000 churches rebuilt in Russia in 20 years - Patriarch Kirill". rian.ru. 3 December 2010. ^ K. K. Cashin. "Alexander Pushkin's Influence on Russian Ballet—Chapter Five: Pushkin, Soviet Ballet, and Afterward" (PDF). Retrieved 27 December 2007. ^ "The USSR and Olympism" (PDF). Olympic Review (International Olympic Committee) (84): 530–557. October 1974. Retrieved 28 March 2008. ^ "IIHF Centennial All-Star Team". Iihf.com. Archived from the original on 10 June 2009. Retrieved 27 April 2010. ^ "Pure gold: Russia repeats!". IIHF. 10 May 2009. Retrieved 28 August 2015. ^ "Russian league tops first CHL ranking". 7 March 2008. Retrieved 28 August 2015. ^ "World of difference for KHL?". iihf.com. 7 May 2012. Retrieved 28 August 2015. ^ Grohmann, Karolos (23 February 2014). "'Excellent' Sochi Games proved critics wrong, says IOC's Bach". Reuters. Retrieved 25 February 2014. ^ "Tourism Highlights 2014" (PDF). UNWTO (World Tourism Organization). 2014. Retrieved 20 January 2015. Look up Russia, Россия, or Русь in Wiktionary, the free dictionary.